This is part three of our posts on How to Start a Public Speaking Career. In the last session, we talked about the easiest way to begin as a professional speaker -- by Speaking within Your Current Industry. In this session, we are going to show you a few simple ways to use public speaking to promote or market your product or service. In fact, using a speech to promote a product or service is a fantastic way to conduct a marketing campaign. The absolute, most common type of speech to market a product or service is a sales call or sales presentation. Although this one has been around since commerce began, it is quickly becoming a lost art. As a result, those who can do this well, are now, highly sought-after in the business world. Salespeople get a bad rap. For instance, in the 1982 movie Glengarry Glen Ross, the salesmen depicted are as dishonest and immoral. The 1980's and the 1990's were the real downfall of the sales role in a buying process, and the advent of the internet has made that role even more challenging. However, in the 1950's and 1960's, if you needed a new suit, you went down to the local department store. The salesperson in the store was an expert on suits. The salesperson would be able to educate the prospective buyer on the qualities of each style of suit, what was currently in fashion, and how to care and accessorize each suit. That role in stores is now gone (for the most part). For big-ticket items like electronics, cars, houses, etc. in times past, we relied on highly educated sales professionals to educate the buyer and to help buyers solve problems. 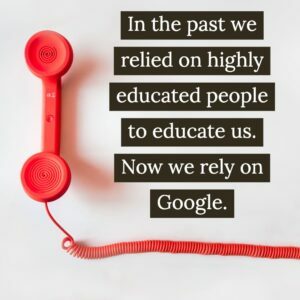 Today, we rely on Google, social media, and YouTube to educate us. That leave a tremendous opportunity for people and companies who understand this need. For instance, although we have a popular podcast, a YouTube channel, and a ton of social media pages, we still get most of our business from people who have a question, and who can't get that question answered anywhere else. When someone calls our 800 number (800-975-6151) they are connected with an instructor who actually teaches our classes. We don't have a room full of tele-marketers who are reading off a script. We have professional educators who can answer any question that a potential customer might have. As a result, we are filling a need that almost none of our competitors have neglected. Sales presentations whether one-on-one or one-to-a-group are becoming a lost art. If you get really good at doing them, you will help your customers make better decisions and increase your income to boot. Prior to the video streaming era, in-person seminars were one of the easiest ways to maximize your promotional time. Instead of setting up a series of individual one-on-one sales meetings, you could invite prospective customers to live seminar. These seminars were often either free or for a nominal fee to encourage audience members to come. Back when I first started teaching leadership seminars, we promoted a 12-week series of training sessions. Since the class was both a significant investment of both time and income, we typically offered an "introduction" session a week before the series started. We would allow people who were interested in the class, but who hadn't yet registered to come and preview the course. It worked really well. The preview session reduced the risk of making a bad buying decision, because the prospective customer could actual see and experience part of the class in advance. If you are over the age of 30, you may remember the financial planners offering the "free how to retire" seminar at the local Holiday Inn. This was a way for the financial planner to show a group of people who skilled he/she was at helping couples plan for their retirement. By offering part of his/her expertise for free to the public, the financial planner was often able to convert some of those attendees to customers. Many companies, big and small, used to invest a tremendous amount of money in TV and radio ads to promote these seminars. Today, though, it is much simpler. With websites like MeetUp and EventBrite, a company can create a seminar or conference with little or no investment. I will give you an example of a very simple one. A local dentist can create a seminar called, "How to Whiten Your Teeth Three Shades in Less than Six Weeks." (I just made that up. I'm not sure if that is actually possible, but you see how that might get someone's attention. The dentist promotes this seminar to every client who come in for a month. The dentist might tell his patients that the seminar is $29 per person, but if they bring a friend that is not already a patient, both of them can get in for free. Or, perhaps we could tell attendees that if they post the event to their Facebook page, they could get free admission. Regardless, we make the fee nominal but give attendees ways to come to the event for a discount or for free. 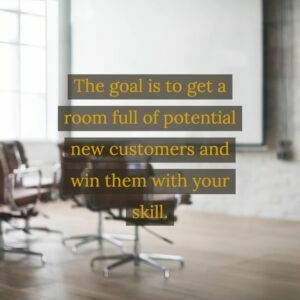 The goal is to get a room full of potential new customers and win them over with your skill as a dentist. By the way, according to a Bizzabo, a company who specializes in event marketing, in-person seminars and conferences are one of the big trends in recent years. Big companies like Apple started the trend with their huge product roll-outs to Apple enthusiasts. However, other huge companies have followed the trend as well. Last year, I was invited to speak at Transitions Academy. This is a conference where eye doctors, lens manufactures, and salespeople come to learn about trends in the industry (and about Transitions lenses). I had a blast speaking there, and the attendees loved the event as well. If earlier, you were wondering, "How in the world could so many companies just eliminate their entire sales force in such a short period of time?" Well, the answer to that is... Webinars. 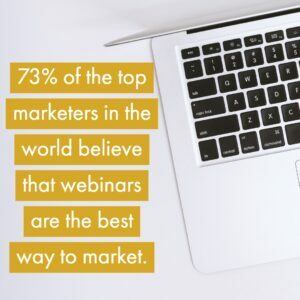 Especially in the business-to-business marketing world, webinars have become the go-to education and sales channel (According to Go-To Meeting... No pun intended.) They claim that, 73% of the top marketers in the world believe that webinars are the best way to market, today. If you recall, since the education function of a sales professional has practically been eliminated in most industries, webinars are a great way both educate you potential customer and move them through a sales process. Just as a warning, leading webinars and leading in-person speeches are TOTALLY different skills. Just because you are good at one, doesn't mean that you will be good at the other. For instance, when I lead an in-person meeting, I typically use few and simple visual aids, because my goal is to build the trust of the audience in me. In a webinar, your visuals are critical to keeping the audience tuned in to the presentation. So, when I speak for 30 minutes in person, I might use three or four slides. But when I lead a webinar, I might go through as many as 20 slides in the same time period. Since this such a challenging type of public speaking, we will spend a bit more time on it in future posts. If you want to really get good at speaking, start a Podcast. However, this is a real time commitment. 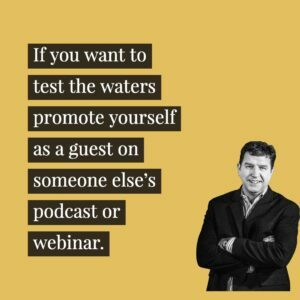 If you want to test the waters, promote yourself as a guest on someone else's podcast or webinar. It does take a little homework to get one of these guest spots, but there is a tremendous opportunity if you are willing to do the work. An easy way to start your search for the perfect podcast is to just Google [Your Industry] with the word podcast. I tried to pick a really obscure career just to show that Google will find anything. I found an article called 12 weird jobs you'll be surprised to know exist published by Business Insider. One of the weird jobs is a "Professional Bridesmaid." If this was your career, you'd likely type "wedding podcast" into Google. When I did, I got Top 10 Wedding Podcasts. You're likely think, "Oh sure, Doug, weddings -- of course there are a bunch of podcasts about weddings." Okay, another obscure career is "Snake Milking." I Googled "Snake Podcast" and I found Best Reptile Podcasts. If you happen to be in either of these industries, I suspect that many of the podcast hosts for these programs would ABSOLUTELY LOVE to have you on as a guest! Once you know who the host is, you can often easily find the person's website, fill out a "contact us" form, and wait for a call back. If you want to move faster on a guest slot, many companies have lists that they will market to and be the host of an impromptu webinar, teleconference or podcast. You can use the same process as we just talked about, but offer a fee to the host. He/she will likely move you to the top of the list. The final genre for using a speech to promote a product or service is video. I won't be able cover everything that you will need to know in order to show the value of video when promoting your product or service. However, let's cover a few basics. The best investment that I ever made for The Leader's Institute ® is hiring a full-time video expert. You don't have to invest in a full-time person, though. You can contract our most video jobs very easily. These experts can give you advice on filming, lighting, and sound as well. YouTube is so hard to break into, that you only want to put your absolute best stuff on that platform. 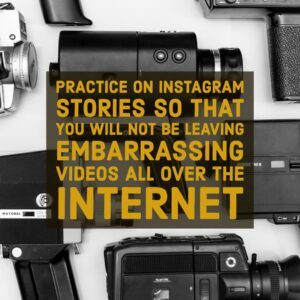 Use Vimeo, Facebook, or Instagram for anything that looks less professional. We will be talking a lot about video (especially live video) on future podcasts, so stay tuned and subscribe to the podcast! In today's world, there are a tremendous number of ways to share your expertise with others to market your product or service. These are just a few. But always realize, that you are your best marketing. A fancy proposal, a flash ad, or an expensive business card will not do nearly as much to promote your product or service as you sharing your expertise with a potential customer!